4 November 2016, at 12:00a.m. When it comes to improving turkey health and performance, new research by Chr. Hansen shows that two probiotic strains are better than one. Two studies were conducted to evaluate the effect of BioPlus®® 2B — a probiotic feed supplement for poultry containing unique strains of Bacillus subtilis and Bacillus licheniformis — on turkey performance. According to Mickaël Rouault, global product manager for Chr. Hansen, the marked improvements in turkey performance confirm synergies between the two Bacillus strains evaluated in the studies. “The studies reinforce the well-documented link between turkey performance and intestinal health,” he said. “Maintaining healthy microbial diversity in the gut is critical not only to meeting turkeys’ unique nutritional needs, but also to limiting harmful bacterial infections that can have a serious economic impact. Both studies were conducted under commercial-like conditions to determine the impact of BioPlus® 2B supplementation on several production parameters. 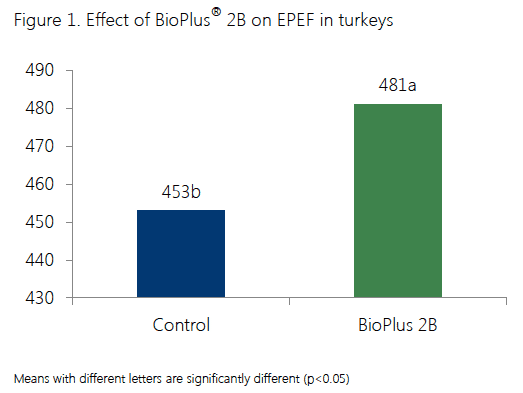 The first trial was conducted in 630 Big 6 day-old turkeys allocated to one of three different test groups: one received BioPlus® 2B for the first 28 days of the study, while another received the probiotic supplement for all 56 days. A third group did not receive any probiotics and served as control. In the second trial, 300 Hybrid Converter day-old turkeys were assigned to one of two test groups: one unsupplemented control group, and one that received BioPlus® 2B for all 84 days of the study. Both trials showed substantial improvements in production parameters in birds fed diets containing BioPlus® 2B. Body weights of turkeys from the probiotic groups were significantly higher than control at day 28 and numerically higher at day 56 (Table 1). Birds that received probiotics for all 56 days of the study also demonstrated a 4.5-point improvement in feed conversion compared to control (1.901 and 1.856, respectively). In the second trial, the final weight of turkeys fed the probiotic-supplemented diet was significantly improved by 4% compared to control (7659 and 7363 g, respectively). The probiotic group also demonstrated a 4-point improvement in feed conversion. The European Production Efficiency Factor (EPEF)was also significantly improved in the probiotic group (Figure 1). The two probiotic strains in BioPlus® 2B also work together to support and enhance digestive function, Rouault explains. In addition, B. subtilis and B. licheniformis enhance digestibility by producing a wide range of enzymes that are involved in carbohydrate, protein and lipid metabolism. By adapting enzymatic action to the substrate, the probiotic strains in BioPlus® 2B have been shown to increase energy release from several individual feed ingredients, as well as commercial turkey feed (Table 2). Furthermore, B. licheniformis supplementation has been shown to increase intestinal surface area in turkeys, thereby increasing the bird’s capacity to absorb feed nutrients.